I read Patricia Bracewell's excellent Shadow on the Crown a number of years back when I first became fascinated by Edward the Confessor, son of Emma of Normandy. Twice-crowned English queen, Emma was an amazing woman and Pat's books explore her in a wonderfully vibrant way. 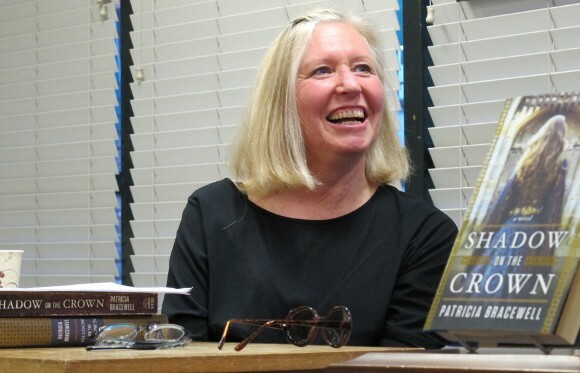 Shadow on the Crown is the first book in a trilogy. It covers the years 1001 to 1005, and explores the marital, familial and political turmoil that Emma faces as a foreign bride in a kingdom ravaged by Viking raiders and internal strife. The Price of Blood then follows Emma into the the years 1006 to 1012 when England itself is imperilled by larger and fiercer Viking armies. Emma must protect her children while she strives to define her role as queen in a world where power is wielded with a sword, not a sceptre. The third book in the trilogy is a work in progress, inching ever closer to completion and I can't wait to read it. Apparently things will get worse for England and for Queen Emma but Pat insists it’s not as grim a story as it sounds and promises there will be a happy ending! Like most people I’ve had many careers in my life: student, teacher, wife, mother, essayist, fiction writer. But I have always been a writer (even as a kid) although the genres I explored frequently changed or overlapped. My favourite thing about being a writer is the satisfaction that I feel when I recognize that a scene I’ve worked on for days is absolutely as good as I can make it. And you r least favourite? The fact that it takes me so long to perfect any given scene. It’s often the case that my first 10 or even 20 attempts at writing a scene are wrong. I should have started in a different place, used a different viewpoint, found another way to describe the characters present, imagined the setting differently, or maybe the dialogue is not going where I want it to go. I wish my brain could work through this process more quickly, but it never gets any easier. Why were you drawn to the eleventh century? It was Queen Emma herself who pulled me into pre-Conquest, Anglo-Saxon England. Although very little of her story is documented, the crumbs that I could glean intrigued me, and I wanted to imagine what her life and her world would have been like. In particular, I wanted to explore how a woman of that time would have negotiated the emotional quagmire that came with her marriages to men who were mortal enemies. Novelist L. P. Hartley wrote, The past is a foreign country: they do things differently there. That, I think, is part of the appeal of historical fiction. We are fascinated by how different that time is from our own. Nevertheless, the people who inhabited that past, even if we look back a thousand years, are not all that different from us today. I think, too, that historical fiction offers an escape from modern pressures, and is a confirmation of the resilience of the human spirit. Look at what our forebears went through – natural disasters, wars, witch hunts, discrimination, purges, horror after horror that for the most part we brought upon ourselves – yet we are still here. Hopefully, people a thousand years in the future will be reading historical fiction about us and learning from our mistakes and our successes. You can buy Patricia Bracewell's books on amazon (or US amazon) or connect with her via her website, facebook or twitter. Or pop onto my facebook page to discuss her books further.